At U.S. Patio Systems and Home Remodeling, we are available to perform walk in bathtub installation anywhere in St. Paul, MN, and throughout the Twin Cities region. Our supplier – Safe Step Walk-in Tub Co. – is the nation’s leading manufacturer of accessible bathing systems for the elderly. Walk-in tubs from Safe Step feature a wide variety of standard safety amenities that most other manufacturers simply make optional. Having a walk-in tub installed in your home will make it possible for you take a long, hot soak in a bath with a variety of therapeutic features any time you like. 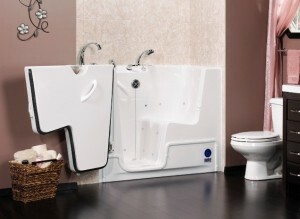 Safe Step walk in tubs come with 10 built-in massaging water jets, a micro-bubble therapy system, and integrated seat heater. Together, these can help provide relief for arthritis, sciatica, shingles, varicose veins, back pain, hemorrhoids, stress, anxiety, and insomnia. For more information, please contact U.S. Patio Systems and Home Remodeling today. We are a dealer for Safe Step Walk-in Tub Co. and proudly offer walk in bathtub installation services in St. Paul, MN, and beyond. Our other services include tub replacement, shower replacement, basement finishing, and the installation of sunrooms, pergolas, and patio covers.